RRB Exam Syllabus for Junior Engineer - Download RRB JE Exam Pattern 2015 - Latest RRB JE Syllabus in PDF: Railway Recruitment 2015 has announce the tentative dates between 22nd August 2015 and 5th September 2015 for computer based written test for the posts of Junior Engineer at various RRB Zones. The Syllabus for RRB Junior Engineer Exam 2015 is important for CBT examination point of view. No candidates can prepare well for Junior Engineering posts without RRB Syllabus. Candidates are looking for RRB Syllabus for Junior Engineering Exam 2015 in PDF on the internet through google.com but still they don’t find the satisfactory result of surfing. Besides that candidates have to click unnecessary links probably advertisement links to download RRB Syllabus of Junior Engineer Exam 2015. The Syllabus of Junior Engineer for Railway Recruitment Exam 2015 is given here in PDF for easy downloading of the candidates. It is well known that RRB will make final selection of the candidates based on competitive computer based online examination and personal Interview. Those candidates who will qualified and achieve cut off marks will be shortlisted for personal interview stage. Railway Recruitment 2015 Notification for Junior Engineer in various disciplines such as Electronics, Communication, Civil, Electrical, Mechanical, Industrial, IT, Printing Press Maintenance, Automobile, & Depot Material Superintendent Departments has become available for most eligible candidates from all over the country. Many lakhs numbers of candidates will apply online for Railway Recruitment 2015 online application form. Thus it is well understood that competitive will be tough in RRB online computer based test. Candidates have been preparing for short cut tricks to achieve cut off marks in RRB from various coaching institutes. 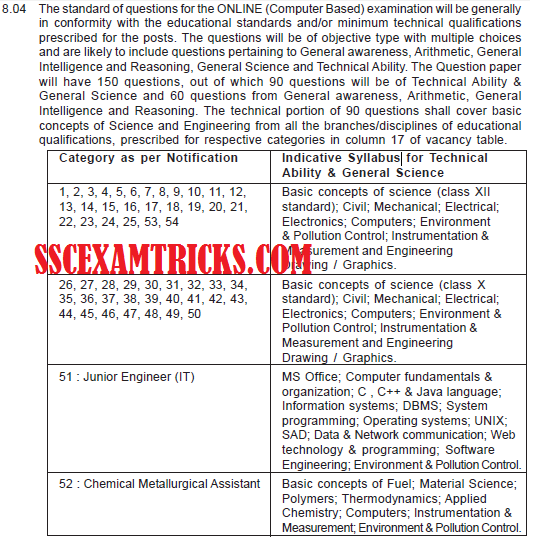 Thus Sscexamtricks.com provides downloadable tips-tricks & General Awareness questions answers sets for Railway Recruitment Exam 2015 for Junior Engineer based on the exam syllabus and exam pattern of the examination. These tips-tricks will be prepared from our best experts & prepared through most popular books to the candidates to achieve cut off marks for Railway Recruitment Exam 2015. Negative Marking – In the computer based test, there will be a penalty of negative marking as 1/3rd deduction in marks in online examination in RRB. Compulsion of Test – The qualified candidates merit list based on cut off marks to qualify for personal interview of the candidates. RRB Computer Based examination will be an objective type recruitment test in which question pertaining to General Intelligence and Reasoning, Arithmetic & General Science and Technical Ability. The Question paper will be multiple choice in which 150 questions Technical Ability & General Science (90 questions) and General awareness, Arithmetic, General Intelligence & Reasoning (60 questions). 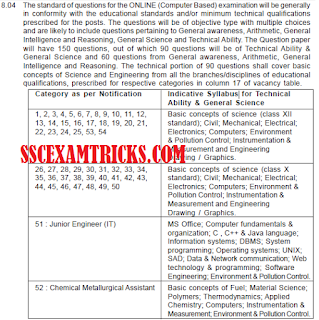 RRB JE Syllabus of Technical Ability & General Science for Category No. 1, 2, 3, 4, 5, 6, 7, 8, 9, 10, 11, 12, 13, 14, 15, 16, 17, 18, 19, 20, 21, 22, 23, 24, 25, 53, 54: In the Technical questions paper questions will be asked from basic concepts of Science and Engineering in various disciplines i.e. Civil, Mechanical, Electrical, Electronics, Computers, Environment & Pollution Control, Instrumentation & Measurement and Engineering Drawing / Graphics up to 12th Class. RRB JE Syllabus of Technical Ability & General Science for Category No. 26, 27, 28, 29, 30, 31, 32, 33, 34, 35, 36, 37, 38, 39, 40, 41, 42, 43, 44, 45, 46, 47, 48, 49, 50: The level of question paper will be 10th Standard in which questions pertaining to basic concepts of science and Engineering in various disciplines i.e. Civil, Mechanical, Electrical, Electronics, Computers, Environment & Pollution Control, Instrumentation & Measurement and Engineering Drawing / Graphics. RRB JE Syllabus for Category No. 52 Chemical Metallurgical Assistant: Basic concepts of Fuel, Material Science, Polymers, Thermodynamics, Applied Chemistry, Computers, Instrumentation & Measurement, Environment & Pollution Control. RRB JE Syllabus of General Intelligence & Reasoning: Several questions will come from analogies, similarities and differences, spatial visualization, spatial orientation, problem solving, analysis, judgment, decision making, visual memory, discrimination, observation, relationship concepts, arithmetic reasoning, verbal and figure classification, arithmetical number series, non-verbal series, coding and decoding, statement conclusion, syllogistic reasoning. RRB JE Syllabus of Arithmetic: Several questions will come from Algebra Basic algebra, factors & simplification, polynomials, Arithmetic Simple & compound interest, installments, taxation, shares & dividends, Ratio & proportion, percentage, time, distance & work, profit & loss, Pipes & Cisterns, Mensuration, Problem on Ages, Investment etc.. From Data Interpretation Use of Tables and Graphs, Histogram, Frequency polygon, Bar-diagram, Pie-chart, Pictorial Graph etc. RRB JE Syllabus of General Awareness: Several questions will come from Indian History, Indian Polity, Current Events, Geography, Economy, Current national & International events, banking, sports, Finance & Marketing, Rail Budget, New Technologies & Reform in Indian Railway. RRB JE Syllabus of General Science: Several questions will come from Class 12th standard from science Physics, Chemistry, Biology and Zoology. RRB JE Syllabus of Technical Ability: Several questions will come from Mathematics from Laplace Transformation, Matrices, and Basic Linear Algebra. RRB JE Civil Engineering Syllabus: Several questions will come from Fluid Mechanics and Hydraulics, Hydrology, Bridge Construction, Water requirements, Highway Planning, Traffic Engineering, Importance of surveying, principles and classifications, Mechanics, Structural Analysis, Concrete Structures, Steel Structures, Soil Mechanics, mapping concepts, coordinate system, map projections, measurements of distance and directions, leveling, theodolite traversing, plane table surveying, errors and adjustments, curves, Environmental Engineering, Estimating, Costing and Valuation & Building Materials. RRB JE Mechanical Engineering Syllabus: Several questions will come from Engineering Mechanics, Strength of Materials, Theory of Machines, Design for static and dynamic loading, Fluid Mechanics, Heat Transfer, Thermodynamics, Power Engineering, Steam Tables, Rankine, Brayton cycles with regeneration and reheat, I.C. Engines: air-standard Otto, Diesel cycles, Metal Casting, Machining and Machine Tool Operations, Metrology and Inspection. RRB JE Electrical Engineering Syllabus: Several questions will come from basics of Circuits and Measurement Systems, Electric Circuits and Fields, Signals and Systems, Electrical Machines, Power Systems, Control Systems, Electrical and Electronic Measurements, Analog and Digital Electronics, Power Electronics and Drives. In Electrical Engineering Key Subject for RRB exam is Electrical Machines, Basics of circuit & Power Electronics. RRB JE Electronics Engineering Syllabus: Electronic Devices: Energy bands in silicon, intrinsic and extrinsic silicon. Carrier transport in silicon: diffusion current, drift current, mobility, and resistivity, Generation and recombination of carriers, p-n junction diode, Zener diode, tunnel diode, BJT, JFET, MOS, MOSFET, LED, p-I-n and avalanche photo diode, Varactor Diode, Analog Circuits, Digital Circuits, Signal & Systems , Control System & Communication Basics. For Electronics & Communications, Basic & Fundamental Electronics Concept, Signal & Systems, Wireless Communication, Antennas, Arrays, EMFT. RRB JE Instrumentation & Measurement Syllabus: Basics of Circuits and Measurement Systems, Transducers, Mechanical Measurement and Industrial Instrumentation, Analog Electronics, Digital Electronics, Signal Systems, Measurement System, Process Control, Measurement, Control Systems & Instrumentation and Transducers. RRB Junior Engineer (IT) Syllabus: MS Office, Computer fundamentals & organization, C , C++ & Java language, Information systems, DBMS, System programming, Operating systems, UNIX, SAD, Data & Network communication, Web technology & programming, Software Engineering, Environment & Pollution Control. RRB JE Printing Press Syllabus: Mathematics & Science up to 10th Standard including Physics, Chemistry, Environment & Pollution Control, Printing techniques, Printing materials, Paper & Ink technology, Digital technology & Imaging, Control Application in Printing, Printing surface preparation, Offset Printing, Color science, Flexo & Gravure, Newspaper printing, Basic concepts of Computers. RRB JE Environment & Pollution Control Syllabus: Nature of questions is Basie Type. It will be a test of General Engineering topics of Environment, Pollution Control Methods, Type of Pollution etc. RRB JE Engineering Drawing & Graphics Syllabus: Several questions will come from Fundamental of Graphics & Engineering Drawing. Here candidates can download English Tips Techniques, memory techniques based on Time Management concept of read once and memorize forever to achieve good result and cut off marks in RAILWAY Exam 2015. Note - For getting latest news about RAILWAY latest jobs, admit cards, results, scorecard, counseling schedule and document verification of the candidates visit regularly on sscexamtrick.com. Final selection of the candidates - On the basis of candidate's performance in the online computer based examination and personal interview taken together.